In Oleksandr Usyk, boxing has a rising, unbeaten star ready to further shake up a revitalized heavyweight division. The Ukrainian fighter just has one last job to finish off at cruiserweight level. Usyk makes the first defense of his four cruiserweight titles when he takes on Tony Bellew in Manchester on Saturday. It will be Usyk’s 16th professional fight, and likely his last in a division he unified in July. The 31-year-old Usyk is planning to make the step up to heavyweight — the division in which he won Olympic gold at the 2012 London Games — and there’s already talk of a fight against Anthony Joshua, the IBF, WBO and WBA titleholder. This all sounds familiar to Bellew. Last year, Bellew climbed up from cruiserweight to heavyweight to fight David Haye, another boxer who intended to use Bellew as a way to get a lucrative fight with Joshua. Bellew upset the odds by knocking out Haye in the 11th round and then, in a rematch in May, stopped the former heavyweight champion in the fifth round. The 35-year-old Liverpool native has already been world cruiserweight champion and has a 30-2-1 record. The fight against Usyk is set to be his last before retirement. It could be the biggest night of his boxing career — and possibly the toughest. Usyk, a southpaw, has risen virtually untouched through the professional ranks since leaving his amateur days behind him after the London Olympics. Eleven of his 15 wins have come inside the distance. As an amateur, he was also a world and European champion. “The only chance I have is a puncher’s chance — I cannot outbox this man,” Bellew said. “He is a formidable opponent. He has everything any boxer could possibly want and he is a horrible southpaw. Given Bellew’s improved standing in recent years and the fact the fight is being held in Britain, Usyk’s profile is set to be bigger than ever if he wins. “Tony is my best opponent ever, definitely,” he said Thursday. Usyk was born in Crimea and has said he was forced to leave the peninsula after Russia annexed it from Ukraine in 2014. 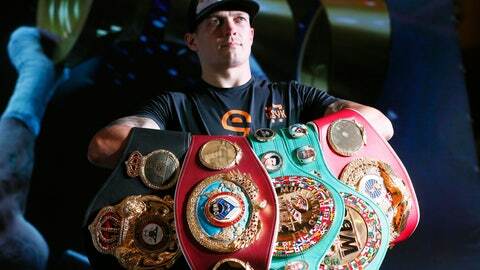 He became undisputed cruiserweight champion after fighting three times in 10 months in the World Boxing Super Series, in which he beat Marco Huck, the then-WBC champion Mairis Briedis, and most recently Murat Gassiev in July. What stood out, in particular, during those wins was his remarkable footwork and movement that the aging Bellew could struggle with. Comparing the two fighters, Bellew — the underdog — appears to have one major advantage: Experience.